Facebook has become a ‘must have’ for business. If you’re on Facebook with your business, there are tips and tricks that you can follow to help increase your user engagement and create a connection with your customers. Given how quickly Facebook changes their business practices, it’s important that you keep up with their policy and layout changes after setting up the page and reading this blog post. I make sure to check in at Mashable every few weeks to ensure I’m not missing anything major. Keep it new and fresh. Frequently update your page to give a reason for your customers and fans to come back and visit. For example, we often will host contests like our “Make It Monday” series or ask questions to get our fans talking. Some ideas for soapmakers might be a ‘spotlight on ingredients’ postings, new product photos and descriptions, behind the scenes, customer question and answers and fun contests. The goal is to engage your fans with the full belief that people buy from people they like and companies they trust. Keep it on topic. Determine what your ‘brand’ is and what you are going to talk about on your FB page. Do you want to let your customers see the wizard behind the curtain or do you only want to keep it very product and company related? Are you going to swear in your posts? Like with many social media outlets, developing a bit of a ‘This is who I am. This is who my company is. This is what I will say and talk about. This is what I won’t post about‘ will help keep your Facebook page relevant. Once your customers ‘like’ your page, it’s important that you keep that branding and ‘posting formula’ in mind so your fans continue to feel engaged. You don’t want them to be surprised or offended by your posts on your business page. When you begin to talk about other subjects you can alienate your customers away from your page and they can end up ‘unliking’ your page. Please note I do not have the same advice for your personal Facebook page. That’s for you to decide – and presumably, you don’t have a lot of customers on your personal page that you don’t know enough to make that decision. Keep your fans and customers in mind. Design your page, graphics and look with your fans in mind. Every picture, post or status should be of value to your fans or help to deepen your connection and relationship with them. If isn’t, it doesn’t belong on your page. Show your customer who you are. Even though your page is for your business, it should reflect you and your personality. That doesn’t mean posting about your cat daily but it does mean showing a little flair and personality. Emoticons are one way to do this (but please, not on everything). If you have a blog, this is an ideal way to link up your personality with your Facebook page. That way, fans can decide if they want to read the blog post or not when you put up that link. Grammar and Spelling. How you spell, how you punctuate, how you structure your sentences and how you talk to your fans is like that first 30 seconds of meeting someone; they say that when meeting someone new that you make a snap decision about that person, without even knowing it. Grammar is like the outfit that you wear to the interview. It is the first thing people see and instantly make judgements on. Remember, it’s not just potential and current customers that are reading your page. You could have press reading your page. Do you think they’re going to interview you if they don’t think you’re professional in your mannerisms? Potential employees will also check out your FB page prior to deciding to join your team so keep it smart and professional at all times. Timely. It is so sad to see a neglected Facebook business page. If you have a business page on Facebook, visit it daily to answer your fan’s questions and comments. When I see a business page that has unanswered customer comments on it that are day or weeks old, I wonder about it. If I’m a paying consumer, I like to see a company who answers fan questions regularly because it makes me feel more confident about ordering and about service after the sale. Encourage feedback. Let’s be honest. Not everyone is going to be a raving fan. If you messed up on an order or if a product isn’t working well, you’re apt to hear about it, in public, on your Facebook page. Every public criticism or negative comment is an opportunity learn, to pick up a dropped ball or to just save a future customer. As long as the post is not breaking your page’s stated policies (which should be somewhere), is not vulgar or inappropriate, keep it up on your page even if it’s incredibly painful to look at every time you visit the page. Watch the Insights. Facebook gives you information about your page for a reason. They want you to use it to improve your content. Some metrics to track are ‘People are Talking About’ and ‘Reach.’ If you keep track of these week by week, you can start to tailor your content for maximum engagement. Pictures. Everyone loves a picture. That’s why glossy magazines still exist and Instagram is so popular. Make the pictures that you post relevant to your business. It’s okay to post a photo of your family, or yes, your cat if it falls within your branding and you’re using it to help make a connection. But, remember why people are coming to your page. If they’re coming to learn more about your company, you don’t want the first thing they see to be a giant photo of your cat or a political statement. You want your last photo to be as good as your first. You’re only as good as your last post, in this case, picture. Quality. People come to your Facebook page to see your products. If your pictures aren’t quality, they aren’t going to buy your products. Invest in a good camera, or use what you have and follow these tips. If you post photos of your manufacturing space or manufacturing process, keep in mind that you want your customers and fans (and any press or regulatory agencies visiting your page) to see a clean, uncluttered workspace that follows Good Manufacturing Practices. Apps. Keep your page relatively simple and clean. Do not clutter it with too many apps or hooks for your fans and customers to wade through. Cover Photo. Surprisingly, an eye-tracking survey showed that people pay more attention to your cover photo than the actual content on your page. Make it professional. Stay within Facebook guidelines. Here’s how to crop a perfect cover photo. Pin, Pin, Pin. Facebook has an option to ‘pin’ a post to the top of your page. Is there something you want everyone that visits your page to see? A photo your particularly proud of? Pin it to the top and it will be the first post that your readers see. Milestones. Use the ‘Milestone’ feature on Facebook to tell the story of your brand. Competitors. Don’t trash talk your competitors on your page. It just makes you look bad… Don’t post negative or know-it-all stuff on your competitors pages either. Think of them with goodwill and if you visit their pages, do so with the desire to educate. Jealously and obsession do you no good as a business owner. Getting more fans. The best way to gain more ‘fan’ or likes on your Facebook page is to continuously come up with the best ideas, content and interaction in your industry. Don’t go to other pages and leave what I call a ‘like and run’ (Posting once saying, “I liked you, like me back please”). Start contests, ask questions, work together with other soapers to increase the entire industry’s reach and educate an entire legion of handcrafted soap fans. Interacting. Interact with other business pages in your niche. Go ‘like’ their pages, let them know you are looking and they will come back to you. It’s fun to make new friends this way but do not poach their customers. There’s a fine line between being friends and being supportive and going over the jealousy or poaching line. 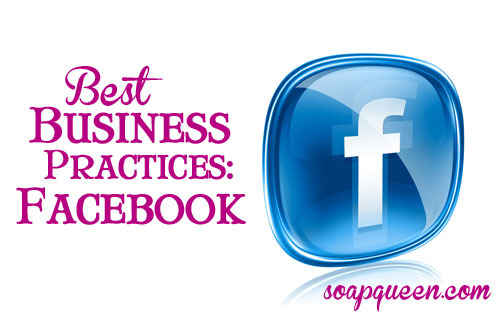 Facebook is a must-have tool for your small business marketing tool box. While other outlets like Pinterest, Twitter and Tumblr are gaining in popularity, Facebook’s platform allows for customers to have an easygoing, personalized method of contact with you, allows you to maintain control over content, and has proven itself to be a social media outlet with legs (thus far). Even if you run a brick-and-mortar shop, an online presence is a best practice. Facebook is an easy and excellent option for being available online to connect with new and old customers, strengthening social ties and providing a valuable services to your clients. Next Post: New for February! This is great advice! I especially agree with what you say about appearance; sharing good quality photos of your products is so vital! I’d add that another reason it’s important is that it encourages sharing. I love to share the work of other related businesses, but only if they have really great photos! You share such great tips, I always see something new I need to work on. Thank you! Thanks for all the great Facebook information! I really appreciate all the business support you provide. Down to the point! Precise, engaging and educative reading, just one of the resons I love Bramble Berry! I have to admit that these kind of posts help me very much in shaping the presentation of my little craft studio. I totally agree that if your company has a FB page (not just a fan page that someone set up, but a real company run FB page), you should check it. Another supplier I have ordered from took a MONTH to log onto the FB account and answer a question I posted. That makes me really feel like they don’t want my business. Thanks for the tips and insight on how to maintain a good Facebook business page. Thanks for the tips and reminders, Anne-Marie! It is nice being able to keep up with people and businesses through FB. And thanks for the link to the cover photo cropper – I’ll have to check that out! Getting the cover photo right can be tricky sometimes.